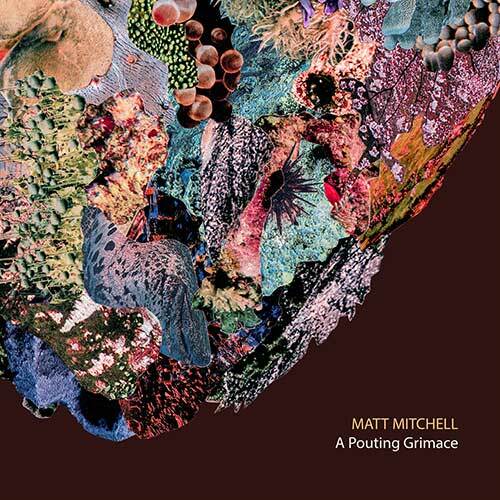 A Pouting Grimace is the audacious new release from pianist/composer Matt Mitchell, whose prior release Vista Accumulation (Pi 2015) The New York Times calls “a bold signature” that “simmers with deep intensity.” Not only is he one of the most in-demand pianists in jazz – Mitchell plays in bands such as Tim Berne’s Snakeoil, Steve Coleman’s Natal Eclipse, the Dave Douglas Quintet, John Hollenbeck’s Large Ensemble, Jonathan Finlayson’s Sicilian Defense, Rudresh Mahanthappa’s Birdcalls, and David Binney’s Quartet — he has established himself as a composer of bold distinction. Substantial in scope, the album, which features twelve musicians: five woodwinds, four percussionists, harp, bass, and the leader on piano, Prophet 6, and electronics, weaves an intricate web of off-kilter rhythms and logical frenzy. Produced by the acclaimed guitarist/composer David Torn, the work is completely beyond genre, a daring tour de force that headily mines the interstice between precision-plotted compositions and the thrill of improvisation.